J.E. Andrews, P. Brimblecombe, T.D. Jickells, P.S. Liss and B. Reid are all based in the School of Environmental Sciences at the University of East Anglia. They have many years experience in teaching environmental chemistry to undergraduates and are internationally respected researchers in their fields. Colour plates fall between pp. 138 and 139. "I can strongly recommend this book as a basic text for all those who wish to gain an initial understanding of the chemistry of the Earth and the way humans are interacting with their environment." 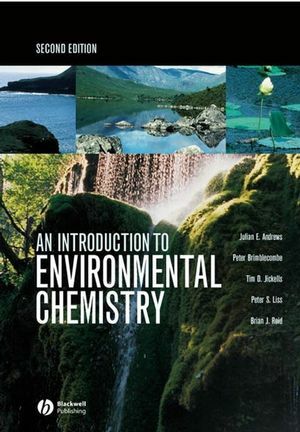 "Overall, this book is a valuable addition to reading lists for students taking undergraduate level courses primarily in Environmental Science, but also in Physical Geography, Earth Sciences and Environmental Chemistry. It is very readable and well written." "If I had to recommend one single textbook for courses in environmental science to students and all those interested from other fields, it would be this one. It is an excellent introductory reader and learning aid." Each chapter contains a list of further reading on the subject area.